This worldwide financial institution is adopting Decision Management and a business rules management system (BRMS) across its business operations. Decision Management is now part of the organization’s core approach to improving the efficiency and effectiveness of their systems and processes. 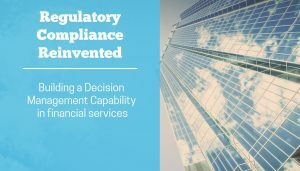 Applying Decision Management to regulatory compliance is enabling rapid, transparent, safe changes to business rules by business users and is an effective approach to upgrading the regulatory infrastructure.